I discovered Plastic Animation Paper (PAP) Pro 4.0 for Windows quite some time ago and even had it installed on my computer for well over a year - unused. The full pro version of the software has been given away for free, no strings attached but with no tech support, since July of 2010. Not to be sneezed at since prior to that date this version sold for 695 Euro (roughly US$900.00). When I discovered it I was still finding my way back into my love for animation and the bug to animate my characters more traditionally via classical, hand drawn 2D animation techniques had yet to take hold. I didn't really understand what PAP did or why you couldn't make complete, finished animations with it. After finding some really great, very affordable, digital storyboarding software, PAP is the next tool in your digital production workflow for those of you on a budget creating traditional 2D animation. Depending upon how finished your storyboard panels are you could even import key panels into PAP and use them as a starting point for developing the animation in each scene. showing the light box effect. PAP has been created by professional animators and is intended as an intermediate tool for creating and even inking animated sequences before the frames are sent to another software application for coloring and further processing. Essentially it's a digital version of a traditional 2D animator's drawing desk and light table. It's where all the grunt work of creating actual hand drawn animation is done. Although you could use it without, it's optimized to be teamed with a graphics tablet such as those produced by Wacom. When you first install and run PAP the first thing you notice about the interface is that everything is non-standard. There's none of your typical Windows menus and even just opening the demo files involves trying to make sense of a non standard file browsing system. It's actually strange how well thought out PAP is for the complex task it's intended for and yet it complicates simple things like opening a file with a non standard file browser. This is the software's biggest draw back however, if you can get past this, by following the software's 12 lesson, online tutorial you'll discover a very powerful program indeed. Possibly one of the best for very fast sketching over multiple frames. This is largely due to the extremely customizable nature of the software's menus in combination with keyboard shortcuts. You can literally use one hand on the keyboard to flip frames backwards and forward as you work, whilst every other command can be accessed with your other hand holding your tablet's pen. A nice feature of PAP is placing the cursor over any tool button will bring up a description of what it does and its keyboard short cut in the help bar across the top of the screen. Everything a 2D classical animator needs is here. You can import backgrounds for reference. Fast sketching and construction lines can be drawn with blue lines. Then all those lines can be erased instantly once they've been 'inked' in black. Black lines can also be converted to blue lines depending on how much clean up 'inking' you really want to do. Sections from a frame can be cut out and moved around. Even entire sequences from multiple frames can be cut out and stamped down in different positions with ease. You can also save your cut outs to libraries and reuse them as often as you like (keep a library of mouths for lip syncing for example). Speaking of lip syncing, PAP will even let you import audio so you can time your animation to whatever sounds you like, whether it's a voice track or music. In terms of drawing its the easiest program I've used that fully supports my Wacom Tablet. More importantly manipulating the canvas is a breeze whether I want to zoom in/out or even rotate the canvas. Pressure sensitivity of the tablet pen is fully supported too - though I find it's better to turn that off and draw with a consistent line in blue as it shows through better when you switch the light box button on. Once you know what you're doing PAP makes animating fun again. It doesn't clutter your work space with hundreds of tools, plug-ins, filters and other menu options that you may never use. Everything is geared towards one thing, drawing and refining animated sequences by hand in a digital environment. It's not quite the same as drawing with a pencil on paper but it's pretty darn close. 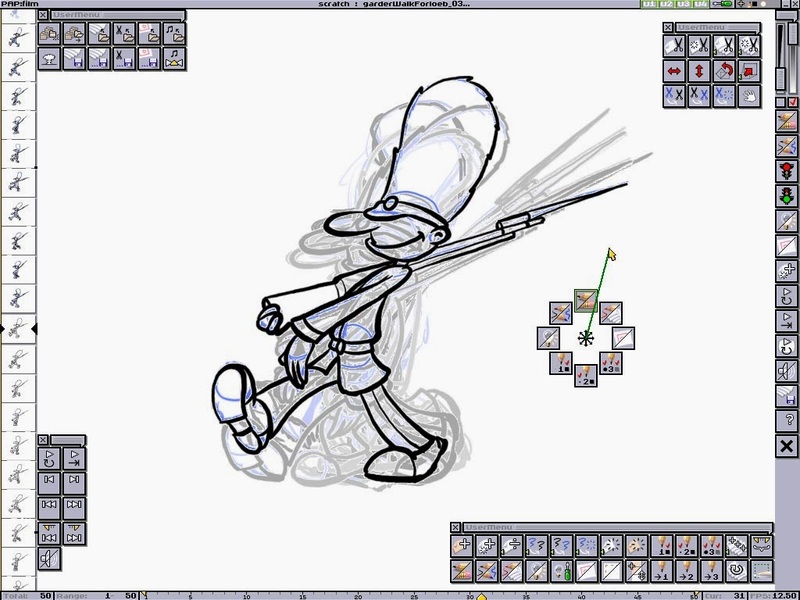 If you're into hand drawing classical 2D animation, and you bought a graphics tablet because you wanted to eliminate paper from the equation then PAP is more than likely going to help you achieve that goal. You'll need to team it up with additional software for coloring and creating your backgrounds, as well as software to composite everything together into your animated film. PAP can export frames to many different image formats and even AVI video files so your choice of software to team it with should be quite broad. As a digital animation tool, I'm highly recommending it. [Update]: Better late than never. Below is my very first attempt at animating one of my own characters with PAP. It's still very rough but watch as Jac the cat continuously makes one of his famous 'Flutterby leaps'. The animation is based on one of the many paintings I've done of Jac and his elusive butterflies. This took me about two hours to go from really rough shapes to something that looked like Jac. Thanks for the heads up. I'll definitely be looking forward to the new resurrected version. Check out my recent post to help you spread the word. I really can't help you. There are no settings within PAP to calibrate a tablet so it may be something specific you need to adjust with the settings on your tablet. The best I can suggest is go into PAP's settings and click the restore factory settings button (located across the top of the screen). It may or may not have an effect. There's a config file you can set up in the root folder of where PAP was installed that will force an X/Y offset. I can't remember the exact format, but search for it.. I'm having the same issue, just open the program without your tablet plugged in, when the program is open plug your tablet in. Please help ! give me clarification. I created a file which was saved according to tutorial, but i dont find my file in the folder pragramfiles>pap_projects>walkcycle>anims as shown while saving. Neither was it saved in program files>pap_projects>scratch>>anims ...! But the file is found when program is open and load icon is pressed...in which it shows pragramfiles>pap_projects>walkcycle>anims....why am i not able to find it in folder normally? Why don't you just find out the name of your file and do a file/folder search of your computer for it. That should tell you where the file is actually being saved. Hi I need some help, I don't know what to save my animation as so that I can come back to it and work on it later. Right now, if I save my project then close that window, I am unable to open it again as a project. hence no more editing can be done on it. Is there a different way of opening it as a project, or does it depend on what I save it as?